Storing chestnuts and saving up a nest egg for a trove of Jackpots is your hot spot at Stash Bingo. Sprinkle it with a brand you can trust and a dash of priceless treasures and you have arrived in an arena of top quality Bingo games. If cash in a flash is your fancy Stash Bingo is the answer to your pie in the cyber sky. The landing page meets the standards of what players would expect for an upstanding online Bingo site. Bright and cheery with a soft pallet of lavenders, pinks and gold, it rises to the occasion with falling coins like not pennies but pounds from heaven! Stash Bingo was established in June, 2013 and is part of the Dragonfish software network. It is quality a player can rely on without any disappointing surprises. It has concrete credentials from software that has fast become an icon in the bingo market today. With a chance to become a millionaire in an instant playing your favorite pastime gaming players are diving right into an enormous opportunity to win big, real big. Stash Bingo is fully regulated and licensed by the Government of Gibraltar abides by the strict rules to operate. It is your complete source for refined bingo entertainment that offers there variations including UK 90 ball, US 75 ball and Swedish Bingo. Each bingo variation brings its own dynamic flavor to the game for a wide range of high quality entertainment value. Free Bingo rooms are open on daily basis with £6,000 in cash prizes awarded every month of the year. Stash Bingo is no stranger to millions starting with the £1 million bingo games plus one million in valuable Loyalty Points given away in Team Bingo. Enjoy Jackpots galore including Guaranteed and Progressive Jackpot games to add a fever pitch to your playing. The same Slots found on the Vegas Strip are available with titles like Cleopatra, Wheel of Fortune and the famous board game Monopoly brought to life on the reels. The graphics, animation and features are what memories of good times are made of. As part of a large Bingo network Stash Bingo can offer players bigger and better standard promotions than other competitors. The new player is gifted with a Bonus when making the first time deposit. Bonuses are regularly available to maximize your bankroll and playing longevity. Magic Monday is Happy Hour time between 16:00 and 18:00 offering oodles of Bonuses. 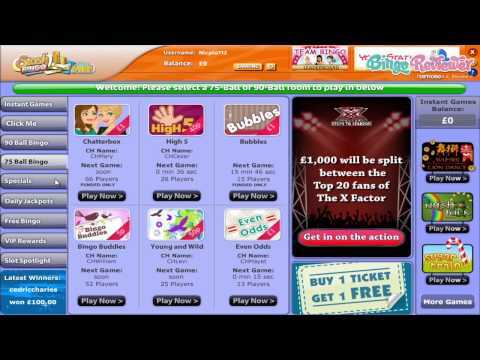 Play absolutely Free Bingo with £200 daily awarded. That adds up to a staggering £6,000 per month, impressive to say the least. The Zodiac and Mystic Guaranteed Jackpot games create of stir of frenzy that is available each month. The BFF loyalty program spoils players with 5 tiers. Rewards include Cash-back, Network Promos, Free Bingo, Re-Deposit Bonuses and more. It is the confidence players rely on as a brand that is part of a large network that has built a solid reputation. Gigantic Jackpots, Vegas style Slots and Swedish Bingo with five ways to win create a dynamic platform to nestle down and stay. We rate Stash Bingo with 4 Pink Hearts. This one actually turned out to be quite good, although I wasn't really expecting much. Right from the start, I thought it looks familiar, and I was right, it is a Dragonfish software site, so most of the games and promotions are well known. When you sign up, you get a 200% bonus (you have to deposit at last £10), and then a 50% reload for all future deposits. Maybe the bonuses are not that high, but you do get a relatively low WR's and that's what counts. There are a few other bonuses, like getting a £10 for referring a friend, so you can score a bit of freebies on the way. As with other Dragonfish sites, you will find classic 75 and 90 ball games, as well as the High 5 bingo, one of my favorites. Very few sites are bingo exclusive, and this one is no different, so you do get a host of other games, dominantly Slots. I absolutely love the layout here. It’s extremely colorful and really catches the eye. The site is extremely organized, clear and concise and signing up is a simple and easy process that takes just a couple of minutes to do! I was very pleased with the welcome offer they have here. It is not a no deposit bonus, but I was still happy with it nonetheless. Basically, they give you an additional £10 free when you deposit £10, giving you a head start toward their games with a total of £20. I went through this fairly quickly, but it is still a nice little buffer when you’re trying out a new site and have no idea what to expect. I found them to have a nice variety of games here that you can’t really go wrong with. It’s standard, but the jackpots can get very big which is always a plus! Overall, great new site! Prior to joining here, I had heard nothing but good things! I know it is new, but word gets around quickly when you have a good site on your hands! It took me no time at all to sign up. I wasn’t crazy about their sign up offer but then again, it’s rare to find really good ones anymore. All in all, it wasn’t too bad. I was most impressed with their games. They offer three types of bingo, which includes both 75 and 90 ball as well as high five bingo. I like when sites give you a minimum of three options to choose from because sometimes the same two types offers everywhere can get a little boring. They have awesome jackpots up for grabs on a regular basis including coveralls and progressives. They also offer a variety of mini games and slots which are always a change of pace every once in a while! I am a really big fan of the promotions here and this site in general. Yes, they have awesome games and great bingo opportunities, but their promotions are really something else! One of my favorites is the grab a grand promo. They give players the opportunity to win a £1,000 jackpot on the first of every month. You can’t go wrong with a deal like that! They also have zodiac bingo which is a really unique addition to the site. With this promo, they give you the chance to walk away with £1,111 in guaranteed jackpots each and every month. Free bingo is another awesome feature that the site has to offer. In fact, they offer it to all players, both funded and non-funded. The free bingo is one of the best things they have to offer here. Don’t miss out on their happy hour bonuses either. Simply deposit during the designated hours and you can earn some extra cash!